Arguably the most attractive part of moving from Manchester to Australia for a year is the great weather and beautiful beaches. So after being away for a grand total of ten months, in May I finally took a weekend off work and visited the largest beachy attraction closest to Brisbane that I knew of – Stradbroke Island. To be honest, it completely amazed me that it had taken me ten months to get here in the first place seeing as it’s around 3 hours door to door and it was one of the first things that inspired me to do a year abroad in the first place; an extremely fond memory of mine is first talking to an exchange student from the University of Queensland at the Manchester Go Abroad fair all those many moons ago in October 2016, and she told me that at the weekend she’d take a break from assignments and go to her closest island to sunbathe and watch dolphins swim. Who doesn’t want that? Me, apparently – after having my sights set on this magical mystical place for so long as a large part of my motivation to get to Brisbane, it had taken me a grand total of nearly a year to get there. Regardless, it finally happened! Getting to Stradbroke Island involved a free weekend, a bus to the centre of the city, a train to the coast and then a ferry over to the island. This is probably the same effort, distance and price as getting from Fallowfield to the Peak District, but with sun instead of sleet and koalas (cliché but true) instead of rabbits. When I initially formed an image in my mind of the second largest sand island in the world, I was drawn to images of beautiful but desolate open and untouched spaces surrounded by nothing but sea. This was all true, with the edition of a few sparsely dotted hostels, bottle shops, restaurants and a boules club. So after checking into a cosy youth hostel on the north coast, we settled in for a long, hard day of soaking up the toasty autumn sun on the beach, still going strong at 25 degrees. The hostel was a classic surfer’s hostel, with sand in every crevice and a few battered acoustic guitars that had probably seen a lifetime of being played ‘Wonderwall’ on around a campfire on the beach, which was a very handy 20 metres away. The long, long walk from hostel to beach. The beach is an endless stretch of white sand bordered with palm trees and shrub on one side and an extremely blue ocean on the other, straight out of a travel brochure. The colour of the sea honestly looked artificial, but the temperature was perfect and we spent a long sunny afternoon splashing around in the surf and playing cricket on the beach. It was hell. At dusk, we headed a little further round the coast to Stradbroke’s main attraction, the north gorge walk. This is a long, wooden board walk that spans a stretch of the cliffs around the north coast, and is definitely the place to be for sun set. From our high vantage point on the cliffs, we were also given a front row seat to huge leatherback turtles, manta rays and dolphins below us which was spectacular. The Australian nature cliché didn’t end there though as heading slightly back inland we passed a dozen kangaroos (including bonus point of a mother with a Joey in her pouch! ), wild koalas and as it got slightly darker, hundreds of bats. The sunset was easily one of the best I’ve ever seen, and we headed back to the hostel with rose tinted goggles feeling drunk on the wholesomeness of the day we’d just experienced. It’s easy to forget that it is actually autumn now on this side of the hemisphere when the days are still so warm, so the 10 degree lows of the night came as a bit of a shock. We managed to overcome this fairly quickly though by hoarding blankets from our hostel and huddling together on the beach for a pretty remarkable astronomical display. The next day consisted of similarly wholesome activities; sunbathing, surfing (which I discovered I am terrible at) and very sadly saying goodbye to the island. However, not for long; I plan to return at least once before I leave to make up for 10 months of lost time! But for now it’s back to daydreaming about dolphins in between assignments. After a whole month of not leaving Australia, my restless nature got the better of me and I decided to give myself a well-deserved holiday from the permanent warmth and sunshine of Brisbane. So after careful deliberation (about ten seconds of it), I booked myself onto a flight to Wellington for a few days. This was particularly exciting for me as not only was this a country I had never visited before, it was also a chance to see family members that I hadn’t seen in upwards of ten years; one of whom had graduated from the University of Manchester with a PhD back in the 1970s. So now that I was already approximately 11,600 miles closer to this branch of my family due to living in Australia, I seized the chance to visit with arms wide open. This made me particularly appreciate my choice of Brisbane for my year abroad as it dawned on me what an amazing platform Australia is to travel the Southern hemisphere, opening up opportunities that would have seemed like a distant pipedream had I still been living in England. 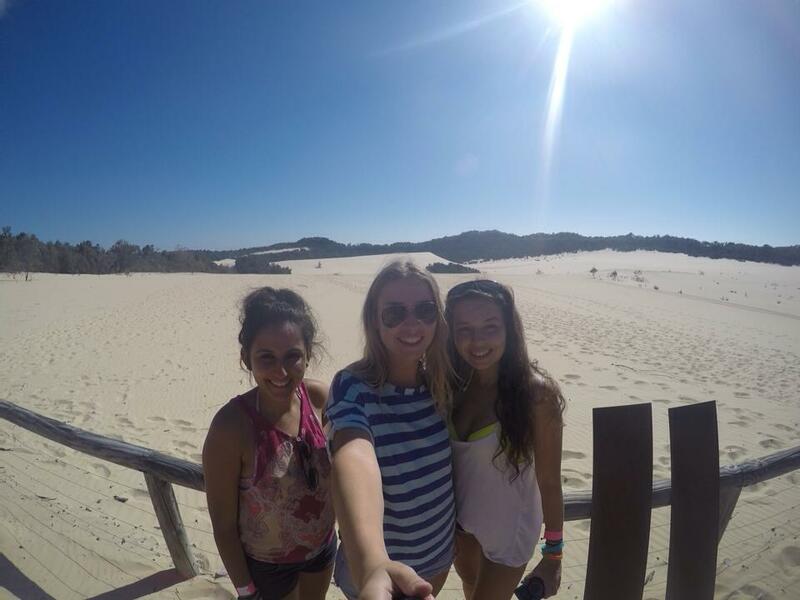 I have received quite a few emails from prospective Go Abroad students asking about how to approach the task of applying for accommodation in Australia, so have been encouraged to write a small blog post about my experience! It is fair to say that one of the best things about spending your year abroad in Australia is the 3 month+ long summer holiday that you are given over Christmas. It allows for lots of travelling, both within and outside of Australia, as well as lots of time for sunbathing! Edible Flower Farming on a Tropical Island! After my Australian Summer travelling around the Philippines and Indonesia was over I still had roughly a month of free time before I was due to go back to University. Most of the friends I’d made last semester had either gone back to the UK for Christmas or were still travelling, so Brisbane was a little lonely! A friend had mentioned to me that you can earn good money working on farms in the Outback so I decided to do some research. Through my research I was introduced to the idea of WWOOFing (World Wide Opportunities on Organic Farms). You do roughly 5 hours work per day on an organic farm and in exchange receive food and accommodation. Although WWOOFing isn’t paid work it was still something to do and I wanted a new experience! I found an advertisement for an Edible Flower farm called Pretty Produce on an island just south of Brisbane called Lamb Island. I emailed the farm owner and arranged to start the next week! Pretty Produce Edible Flower Farm, Lamb Island. By the start of semester 2, I was feeling much less of a tourist, and Brisbane felt more like home to me. I went into this semester feeling a lot more relaxed now that I already knew my way around, and it was a lot less scary than the start of semester 1. Time had flown so fast, I couldn’t believe that I only had four months left, so I tried to make the most of my remaining time down under. I scheduled my classes so that I was only in uni three days a week, which meant I could regularly go on trips for long weekends! The first trip I went on was to Moreton Island. Although I had already been last semester I felt like I needed to go again since it was so much fun. We went with Quest (the International Society at UQ) and spent this weekend snorkelling round the shipwrecks, sandboarding, and visited the lakes. My next adventure was my east coast trip! This is a must-do trip while you’re in Oz. We started by flying up to Townsville and then visited Magnetic Island for the day. Here they have wild wallabies all around the coast which are very friendly if you bring them food. Our next stop was Airlie Beach, which is a very popular place for backpackers and so there’s a lot more to do there. 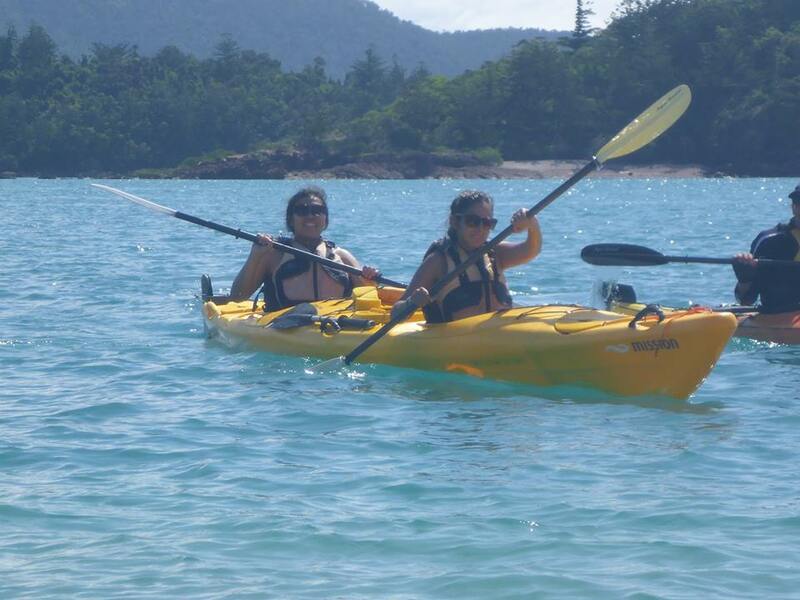 We took a kayaking trip from Airlie Beach and went around some of the Whitsunday Islands, where we also had the chance to snorkel on the amazing reefs. 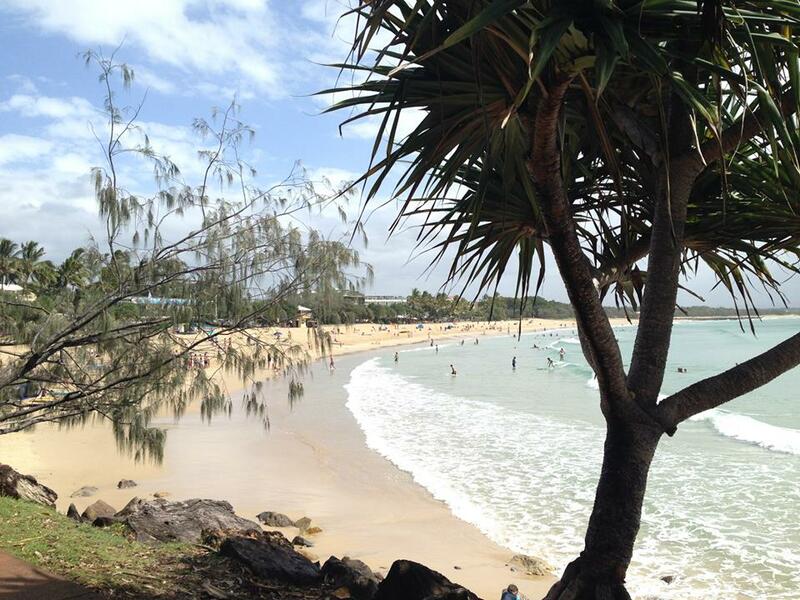 Then we took an overnight coach to Noosa, which is on the Sunshine Coast. Here I finally took some surfing lessons, and after about two hours of constantly falling off my surfboard, I finally caught a wave and managed to stand up! Noosa is also great for its walking trails and the views are spectacular. After Noosa we took a train back to Brissy, and after nearly two weeks of travelling hostel to hostel I was happy to see my bed again. Regarding university, semester 2 was pretty similar to semester 1. I tried my best to choose modules that didn’t have clashing coursework deadlines, since I knew I was going to do a lot of travelling this semester. UQ is very similar to university in Manchester in the way that coursework and exams are carried out and marked. Each module has a tutorial group which is usually discussion-based, and all lectures are recorded and put on Blackboard. 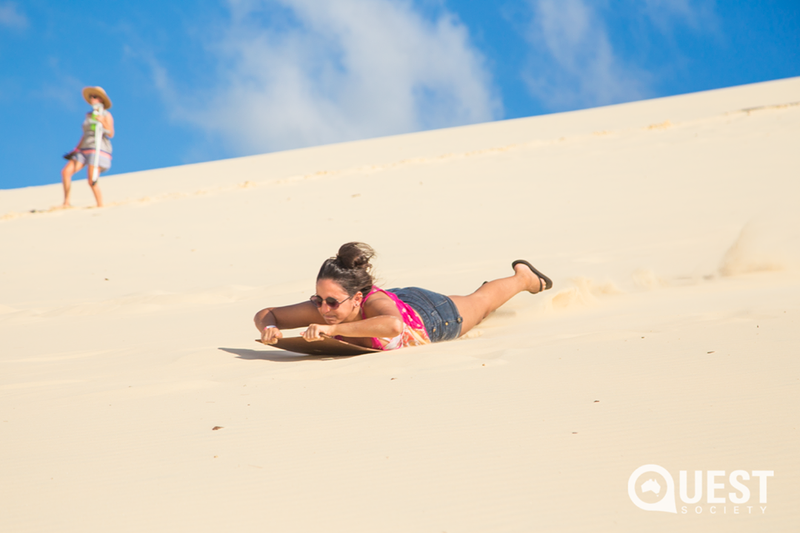 Kayaking around the Whitsundays Moreton Island Sandboarding – more scary than it looks!